I’ve already talked about my love for green smoothies, and how they can help you lose weight, but there are juicing recipes out there that are just as beneficial. They can help you bust belly fat, detox your body, and cleanse your system, plus they’re tasty as can be with all-natural fruits and veggies. So if smoothies aren’t really your thing, or you’re craving a change, juicing is the way to go! My dad hopped on the juicing train way before it was ever a “thing.” When I was little he would make juices in his juicer all the time, my favourite being an orange, carrot, ginger medley of some sort. But I wasn’t convinced. At such a young age, I didn’t realize all of the nutritious benefits that those homemade juices could have, and would often opt for store-bought juice, that of course is full of sugar. Kids, right? Now I praise my dad and his health-nut, juicing ways. Homemade juices are a great way to get the nutrients and vitamins your body craves and needs to function. It’s not always easy to get the recommended dose of fruits and veggies on the daily, but juicing recipes make it simple and fun. Plus, as we head into summer, you may have your bikini body on your mind. With a healthy diet and regular exercise, these delicious juicing recipes are sure to help you lose weight and look amazing from the gym to the beach and everywhere in between. You can really add just about anything to your juice. Everyone has different taste buds and enjoys different fruits and vegetables, which makes juicing personal! 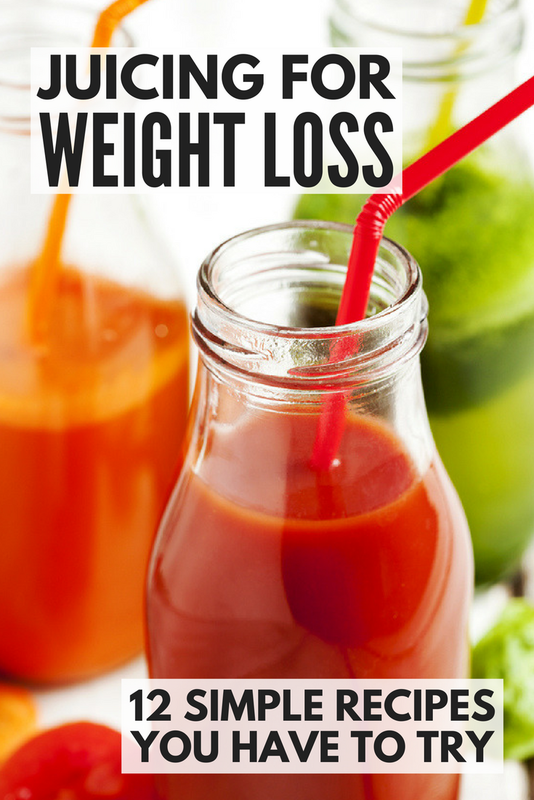 If you’d rather have some direction and suggestions, I’ve rounded up 12 amazing juicing recipes for weight loss, and I highly recommend you watch Joe Cross’ documentary, Fat, Sick, and Nearly Dead and buy his book The Reboot with Joe Juice Diet: Lose Weight, Get Healthy and Feel Amazing. This is green juice at its finest. If you are a green juice lover, this is one to add to your rotation, and if you’re not, this will be the one to change your mind. Yes, there’s spinach, but with the blend of mango and pear, you can hardly taste the spinach at all – it just gives the juice its bright green colour and loads it with nutrients! With metabolism-boosting lemon, not only is this juice great for weight loss, it’s also amazing for your skin. Kale is a superfood that cleanses and detoxifies the body, and the addition of beets gives it its amazing pink colour, and is full of vitamins and minerals. This juice is an absolute must for a healthy body. These three super-ingredients make for a healthy and delicious juice you’ll want to drink on the daily. Watermelon and pineapple are nutritious with anti-inflammatory properties, and ginger aids digestion and works to boost your metabolism. This green lemonade is a delicious way to get your fruit and veggie intake. With cucumber, kale, ginger, apples and more, this is one healthy, fat-busting juice. The kale is packed with anti-oxidants and the cucumber is ultra-hydrating. You’ll feel healthy as you sip away. I’ve recently become a big fan of blood oranges. They’re so tasty and are super high in vitamin C, just like other citrus fruits. The addition of serrano chili is so unique. Plus, any hot pepper speeds up your metabolism, helping with weight loss! As the name states, this green juice is ideal if you want to lose weight. The ingredients will also boost your energy and support a healthy diet. The creator of this juice lost seven pounds in six weeks after juicing once a day and making no other lifestyle changes. Give it a go! This juice recipe is called an immune booster for good reason! Each of the ingredients is chock-full of vitamins and are great sources of anti-oxidants. This juice is sure to detox your body, helping you lose weight and contribute a healthier lifestyle. It doesn’t get any better than this. Watermelons and cucumbers are both SO refreshing, especially in the summertime. This recipe sounds absolutely delectable, and watermelon and cucumber are both made up primarily of water, but are still packed with nutrients! It’s the perfect combo! I didn’t know how amazing purple cabbage was for you until researching this post, but I have to say, I’m really impressed! From being a powerful antioxidant to reducing inflammation and improving blood circulation, the health benefits of purple cabbage are plentiful. Plus, it makes for a really pretty juice colour. This is one recipe I’ll be trying ASAP. Drinking this juice is a natural way to bust belly fat. It will cleanse your system, boost your metabolism and immune system, and help you lose weight. With cucumber, parsley, ginger, lemon and water, it’s a great way to stay hydrated and reap tons of nutritional benefits. Beneficial in so many ways, this beet, carrot, apple juice is great for your body and metabolism, plus with a little bit of ginger, it has some extra zing! Ginger is one of my favourite ingredients to use in both juices and smoothies – I love the taste and it is crazy good for you! This juice recipe is the perfect summer sip. It’s refreshing, sweet, and perfect to sit out with on a sunny day. With five simple ingredients including strawberries and fresh lime juice, this juice is sure to be a go-to this season! Juicing is a healthy and tasty way to get your fruits and veggies. Try one (or all) of these juicing recipes and you’ll be able to find which one you love best and can make them day after day for weight loss and detoxifying benefits! If you enjoyed these juicing recipes as much as us, please share them on Pinterest! And if you’re looking for more health-related tips and tricks to help you lose weight and look great, please follow our Health board where we share all kinds of great ideas!